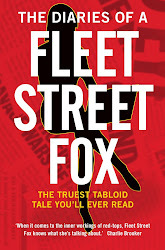 fleet street fox: Think on. THE problem with the thought police has never been that they think too much. They don't have a uniform, or a warrant card, or rules. Its members join in whenever they feel like giving someone a shoeing. And the only way you can identify the thought police is their lack of any actual thought. They don't ponder the rights and wrongs of a situation first. They don't seek a consensus of opinion so they know they're in the right. They just get out the truncheons and wade in, policing all over the place like Gene Hunt on a bad day without at any point engaging brain. That's why three foster children in desperate need of a loving family were taken from a Rotherham couple who voted for a political party that social workers didn't like. That's why a white woman who'd fostered half a dozen children and raised four of her own successfully was told she'd never be able to adopt a black girl she'd looked after from the age of two months. It's why a narrow group of individuals want millions of people not to be able to read popular newspapers they disapprove of; it's why we give £270million in foreign aid to Rwanda even when the UN thinks the president's a warmonger; it's why calling someone Australian is apparently now racist. It's why idiots on Twitter are subjected to 3am police raids, why Facebook posts can land you in jail, because thoughts that just aren't fashionable are somehow considered 'bad thoughts'. There are no rules against any person voting for anyone they fancy in this country, nor reading any newspaper, associating with people of different race or religion, or writing thoughts which go against the grain on Twitter, Facebook or anywhere else. A social worker - and anyone else for that matter - may support whichever political party they fancy, from BNP thugs to the stinky hippy Socialist Workers. A white person may have babies with a black person, or become a step-parent, and raise children of a different racial background to either of them without the state intervening and taking them away because their ethnic mix doesn't 'colour match'. You are allowed to walk to the paper shop and pick up whichever one takes your fancy, panders to your needs best or interests you without a self-appointed campaigner telling you that your choice doesn't meet with their approval. But you and I can do all those things only so long as we conform to the general fashion. If you do it in such a way that does not meet with mass approval then you'd best do them with a bag over your head and not shout about it or you'll be beasted by Twitter, Hugh Grant or social services whether it's merited or not. Social conformity is one of the many things which keep human beings generally in line - it's why we don't all put our clothes on backwards, walk around naked or burn the neighbours' house down. It's a good thing, most of the time, to try to fit in socially. But individual conformity, forcing someone to fit in mentally on pain of prosecution or persecution, is always a bad idea and not so much the thin end of the wedge as a giant leap towards state control of the very thoughts in our heads. The King of Bahrain jails people for being rude, and these days so do we. If you make the mistake of voicing thoughts which do not comply with the fashionable view you will be told that you're narrow-minded by people so narrow-minded themselves they can't bear the thought of you thinking differently to them. If they stopped to think for a minute, they'd realise that's not freedom. It's how every totalitarian regime ever to scar the Earth began, and it's a really bad idea. Imagine, for a moment, what would happen if the thought police got their way. Whether you like UKIP or not, if no-one voted for them there wouldn't be a debate about immigration and there's no reason not to have the debate about how much is a reasonable level and how much is too much for a small island to cope with. If no-one was able to look after children of a different cultural background to themselves that would logically mean that inter-racial relationships were illegal and all nurseries and schools had to segregate different ethnicities among pupils and staff. I'm pretty certain they tried that in South Africa and it didn't go down well. If you could only read a newspaper that met with the approval of the state and never kicked the powerful up the bum or entertained a living soul with a funny picture it would be called Pravda and, what's more, your taxes would be used to pay for it. And if you can't refer to the country someone is from without breaking the law then we can't say who the Queen is Queen of, mention that Billy Connolly and porridge oats are Scottish, and we won't be buying English Breakfast Tea any more either. The thought police didn't use to matter much, but there are more thoughts expressed these days and they are easier to see and hear. There are on social media, on comments below internet articles, and handed out on 24-hour news channels in discussion of the stories of the day. Because we see more thoughts than we are used to we are taking more offence at the slightest thing without stopping to think whether we need to bother. The thought police, you see, are not just dippy social workers or over-aggressive coppers; they're you and me, the general public who kick off whenever something upsets them without stopping to wonder where it will lead. Too much policing and not enough thought leads, always, to a society where everyone thinks the same and if they don't they're too scared to say so. It ends up that there are no fashions, no passing trends in thought or politics or anything else, just the suppression of every single sort of difference and criminalising of things which someone, somewhere, thinks is not the norm. The fact is, it's normal to be different. It's normal to be imperfect, to think for yourself, choose your newspaper and vote how you please without someone telling you it's wrong. It's not normal to shut down other people's mental processes, and nor is it free. Not only is it expensive paying for all those jackboots, the cost to our society as a whole is we lose all the imperfections which are what force us to be free and fair in the first place. Now, there's an unpleasant thought.